“Yikes,” I thought during a recent run, “my mind is a bit toxic!” Typically, running is a mindful and peaceful experience for me — my attention effortlessly focused on just running. It’s meditation in motion. But not so during this run. My efforts to practice mindful running and present moment awareness had little affect on my mind that was very busy serving a full course meal of concerns seasoned with resentment. We’ve all been there. Some days we are at peace. Some moments we easily focus on what’s right in front of us. Then we have days when we are distracted by our thoughts and feelings. And at other times, our mind is serving up a plate of toxic treats that we just can’t seem to resist. As I continued my run, annoyed that my mind was running toxic, an image emerged in my mind’s eye. It looked like a target; let’s call it the Target of Awareness. As I explored this image, I realized that the outside grey ring represented negative thoughts and feelings, the inner green ring — neutral thoughts and feelings, and the bullseye — positive thoughts and feelings. As I continued my run this image followed. So I began to experiment with it. I began to bring nonjudgmental awareness to the ongoing stream of negative thoughts and feelings. Aware of the bullseye at the center, I redirected my attention from the outer ring of negativity to the middle ring of neutrality. And whenever my attention drifted back to my concerns, I redirected my focus to the ring of neutrality. And once my attention rested for a longer period of time there, I redirected attention to the bullseye of positivity. In mindfulness meditation, a common practice is to focus attention on sensation of breath. When the mind wanders, attention is redirected back to the breath as often as is needed. Awareness is an important element of practice, in this case realization of when the mind has wondered away from the breath. The mindful cleanse practice I’m describing is similar in a sense. Attention is anchored at the center of the target on positivity (of thoughts and feelings). When your attention wanders from the center towards the outer ring of negativity, redirect it back towards the center — again and again, without effort and without judgement. Physical sensations of any experience (pleasant or unpleasant) can be separated from the thoughts and emotions about the experience. 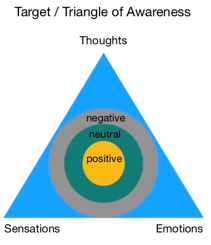 The triangle of awareness is about learning to separate and distinguish what is being felt in the body from what is being thought in the mind, and to separate and distinguish thoughts from emotions (feelings and moods). With practice, you will learn to experience the three components of the triangle as distinct. 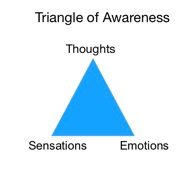 Combining the Target of Awareness with the Triangle of Awareness gives us a powerful working model. In any moment, any of the three elements of the Triangle of Awareness can take center stage and pull you away from the center of positivity or towards it. For example, discomfort or pain in the body can pull you off center towards negative thoughts and/or feelings. Thoughts themselves can pull us off center when they are anxious or negative. Negative emotions can also pull us away from our positive center. On the other hand, pleasant sensations in the body can pull us towards the center of positivity. Pleasant thoughts and/or pleasant emotions will also draw us towards our center. The first step is awareness. Notice if your mind is running a bit toxic and could benefit from a mindful cleanse. Use the Triangle of Awareness to notice which of the three elements (thoughts, emotions, sensations) are taking “center stage” and pulling you off center. Use the Target of Awareness to explore the quality of your thoughts and feelings, noticing if they are negative, neutral, or positive. 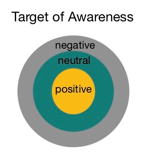 Use the combined model to notice the interplay between the Triangle of Awareness and the Target of Awareness. The benefits of increasing mental and emotional awareness are considerable. Cultivating the ability to notice the interplay of thoughts, emotions, and sensations, supercharged with awareness of the continuum of mental/emotional negativity, neutrality and positivity, will empower you to observe your mind without judgement.